Non-bankers can learn to understand the mathematical models that have made the headlines so many times in recent years. A course for students of economics, business studies, mathematics, physics and computer science. Learn how to measure the risk of an investment portfolio! In this course you will simulate the time evolution of prices of financial assets, use the Black-Scholes model to price European or Asian options and compute the Value-at-Risk of a portfolio. The approach is hands-on with a strong emphasis on practical simulations that you will program, run and explore in your own computer. "Monte Carlo Methods in Finance" will be offered on iversity from 20 January, 2014 until 16 April, 2014. Chapters are divided into units. Each unit consists of a video followed by a quiz. At the end of each chapter you will solve and turn in some homework exercises. In these exercises you will explore additional material on your own and then respond to questions in multiple choice format. Some of the explanations in the videos and the exercises make reference to short programs that you can download and execute in your own computer. You are encouraged to experiment with these programs (modify the values of parameters, complete or rewrite the code to alter the model or to implement related functionality) and run your own simulations. The code provided can be executed in either GNU Octave or MATLAB. You will receive a certificate of participation after having completed at least 75% of the course learning activities (videos, quizzes and homework). Why are random numbers needed in quantitative finance? And, if they are random, how can they be used to give precise, accurate answers to quantitative financial problems? What is geometric brownian motion and how can it be used to simulate the evolution of asset prices in financial markets? How are Monte Carlo methods used to determine the right price of a derivative product, such as a European call option? What is the theory of copulas and how can it be used to model general dependencies among financial assets? How is financial risk modeled, characterized and quantified? You will need between 5 and 8 hours of work per week during a total of 12 weeks to complete all the learning activities, including the homework. The course is geared to students not only in economics and finance, but also in mathematics, computer science, engineering, physics and the natural sciences. No knowledge of finance is required. Basic knowledge of Calculus (integration and differentiation, Taylor series), Linear Algebra (matrices, determinants, eigenvalues and eigenvectors) and Probability (random variables, probability density and cumulative distribution functions) at an introductory undergraduate level is strongly recommended. Programming knowledge is recommended. We will be designing simulations that can be executed in either GNU Octave or in Matlab. The programs will be short, intuitive, fully documented and easy to follow. Yet they will be powerful tools under your control, and will allow you to explore, experiment and learn at your own initiative. Special thanks to Profs. Jose Luis Fernández Pérez and Santiago Carrillo Menédez from the Mathematics department at the Universidad Autónoma de Madrid for their input and advice. Where can I find the software needed for the course? The programs used in the course can be executed either in GNU Octave (version 3.6.4) or in MATLAB. GNU Octave is freely redistributable software and can be downloaded from http://www.gnu.org/software/octave/. The version that should be used in Windows is Octave3.6.4_gcc4.6.2, which can be retreived at the URL Octave 3.6.4 for Windows MinGW. Please follow the instructions in that webpage to install the software. MATLAB is commercial software and you need to have a valid license to install it in your computer. As a result of support from MathWorks, students will be granted a downloadable license to MATLAB and the recommended toolboxes (Statistics and Optimization) for the duration of the course. Where can I find information on the iversity platform? Please have a look at the iversity FAQ if you have any general questions regarding the platform. 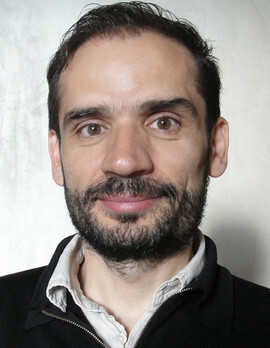 After studying Chemistry at the Universidad Autónoma de Madrid, he received a Ph.D. degree in Physical Chemistry from the Massachusetts Institute of Technology (MIT) in Cambridge and held postdoctoral positions at Stanford University, at the Université Libre de Bruxelles and at the Katholieke Universiteit Leuven. Other appointments at the International Computer Science Institute at the University of California, Berkeley, and MIT followed. He has worked on relaxation theory in condensed media, stochastic and thermodynamic theories of nonequilibrium systems, lattice-gas automata, and automatic induction from data. His current research interests include machine learning, quantitative and computational finance, time series analysis and information processing in the presence of noise.